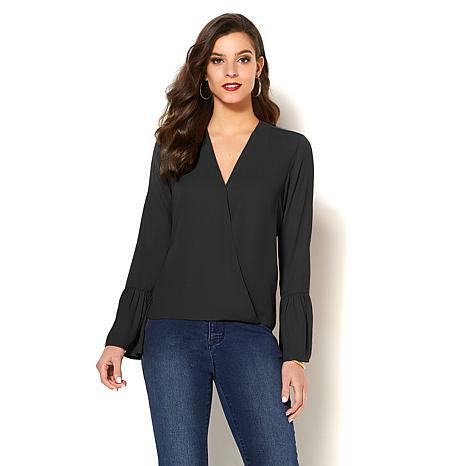 You'll be dressed to impress when wearing this gorgeous crossover bell-sleeve top. Paired with any of your favorite bottoms, create sophisticated looks that are ideal for work or play. Beautifully made and perfect fit. Very pleased with this purchased. I ordered the large size due to other reviews claiming the waste was tight. I tried it on and noticed the opposite. The large was big around the breast and waist. The medium would have fit me perfect. I decided to keep it because I dont like blouses that cling to my body. I love everything about this top. 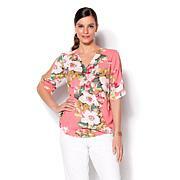 The print is amazing, the vneck (with hidden snap closure for modesty) and the modern front and back shape. Iman, please make more tops like this! I got two of these tops and they are gorgeous. I love them. Very sophisticated and you can dress them up or down.